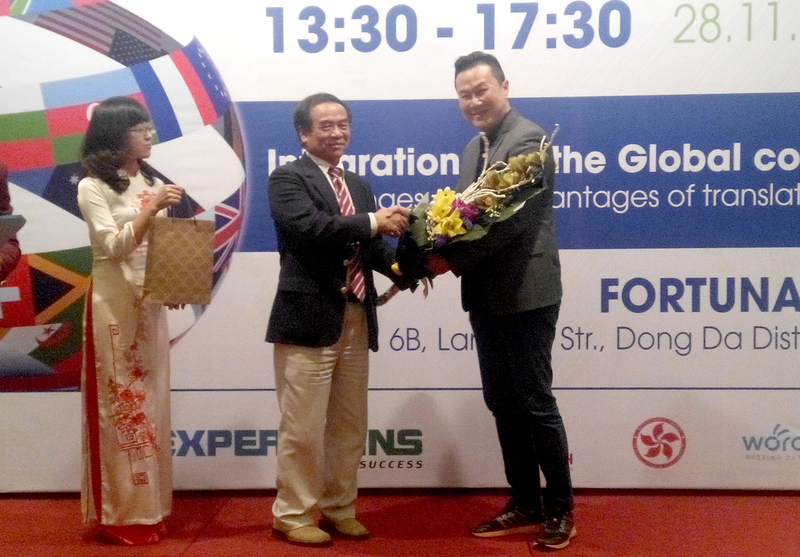 During the VATI Conference 2015 in Hanoi, Vietnam, the CEO of Lingua Technologies International, Mr. Nickson Cheng, was asked to give an impromptu closing speech by the Guest of Honour, former Chief Representative of the Vietnamese delegation to the WTO, Mr. Ngô Quang Xuân. “What you guys are doing is fantastic! Communication is the most important among human beings. We speak different languages but all we want to do is to be heard. And the important thing that we are doing is to make sure whatever we say make sense, whatever we say does not introduce conflict. So what we are doing right now, as AATI and as VATI, is to trying to raise this standard for everyone that is involved. By raising this standard, not only can we safeguard our livelihood, we can also facilitate communication very well. I am not a linguist. I am a business person. I started a translation company. I was forced to do editing. Although I know a few languages but I think I am more proficient in my Chinese and my English. When I started doing editing for Malay, Indonesian, Chinese and English, I started to appreciate what linguists have to go through. The amount of time we spent on a certain work that we have produced sometimes is not appreciated by your clients. Just because of a change in reviewer, just because of a change in views, sometimes your precious work can become rubbish and they can tell you that you are translating nonsense. What we are attempting to do here, is to set a certain standard. So this standard, as long as we have met it, I think, we have achieved what we want to achieve. And the purpose of doing translation or producing any translation or interpretation work, is to produce something that is fit for its purpose. It need not be the best in everything that you have written. We are not writing a novel. We are not writing a poem. But we want to facilitate communication. Interpreters and translators, although have the foundation of being good in 2 languages, at least their own native language and a second language, but requires different skill set, must have different aptitude. If you are a good translator, it does not mean that you are a good interpreter. I think Mr. Ngon has brought up a very interesting example. When you are in front of foreign delegates, and when the interpreter mentioned something wrongly, it is an insult, not just to your visitor but also to yourself. I think as AATI and VATI, this sort of association, will improve what we want to do as an industry.